Hawaii’s beautiful and unique ecosystems, limited developable land, and passionate communities are some reasons why developing a new large-scale renewable energy project in Hawaii can be challenging. The resources below were developed to help identify potential issues early in the project development stage to enable decionmaking before significant project investments are made. This Guide provides information on siting and permitting renewable energy facilities in Hawaii, including lessons learned from actual Hawaii renewable energy projects. 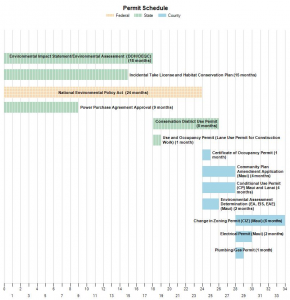 The UNOFFICIAL Permit Briefs provide process flowcharts, estimated timelines, resource references, and other guidance relevant to nearly 200 individual federal, state, and county permits and approvals that may be required for renewable energy projects in Hawaii. The Wizard helps users identify the county, state, and federal permits that may be required for individual projects, and produces a project-specific Permit Schedule with suggested permits, sequencing, and timelines. NOTE: Wizard users must register to create an account or login in order to download completed project permit evaluations. 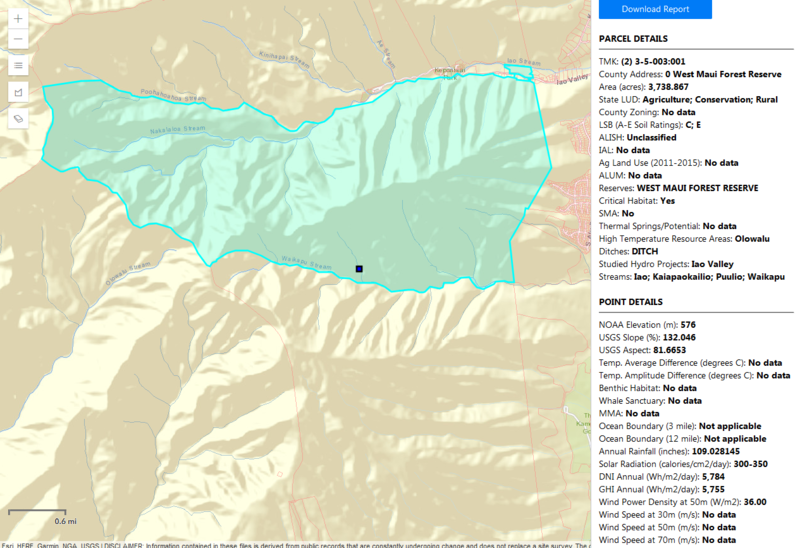 EnerGIS supports the appropriate siting of renewable energy projects in Hawaii by providing energy resource and physical site information for sites selected by the user. EnerGIS also enables users to search for Hawaii sites with certain desired attributes and supports project permitting by providing information on site zoning, soil type, and the presence of sensitive or regulated resources. 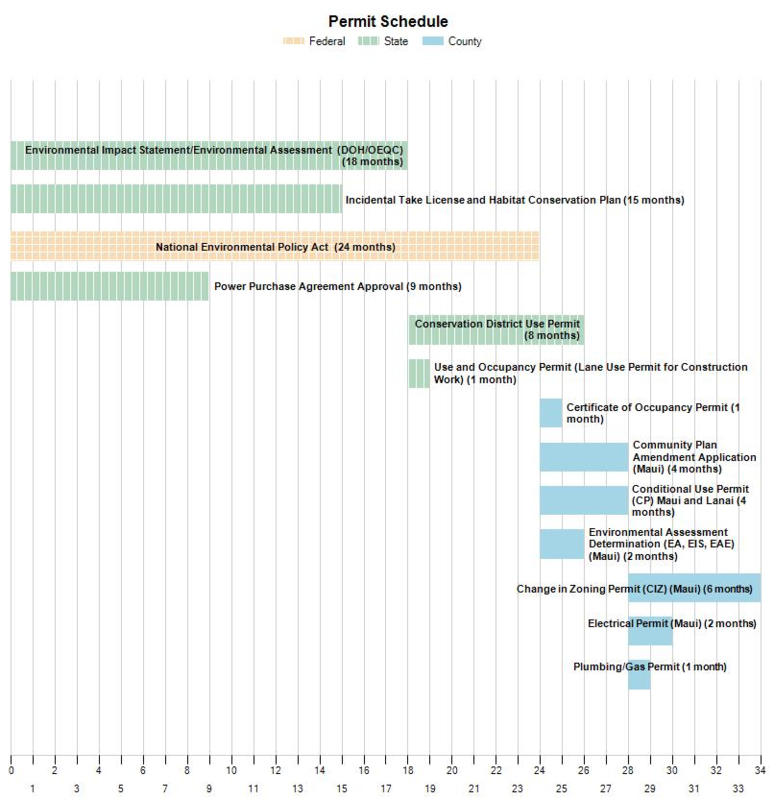 e-Permitting provides online permitting for Hawaii Department of Health Environmental Health Administration (DOH EHA) permits and approvals that may be required for renewable energy and other types of projects. DOH serves to protect and improve the health and environment for all people in Hawaii. The Department of Land and Natural Resources (DLNR) provides online permitting for certain DLNR permits and approvals that may be required for renewable energy and other types of projects, specifically permits from the Engineering Division and the Division of Forestry and Wildlife Native Invertebrates Program. DLNR serves to enhance, protect, conserve and manage Hawaii’s unique and limited natural, cultural and historic resources. The Hawaii Clean Energy Programmatic Environmental Impact Statement (PEIS) analyzes, at a programmatic level, the potential environmental impacts of clean energy activities and technologies in the following clean energy categories: (1) Energy Efficiency, (2) Distributed Renewables, (3) Utility-Scale Renewables, (4) Alternative Transportation Fuels and Modes, and (5) Electrical Transmission and Distribution. The PEIS was developed by the U.S. Department of Energy in partnership with the State of Hawaii and was published in September 2015. The Office of Environmental Quality Control (OEQC) facilitates Hawaii’s environmental review process, which is required for most large-scale renewable energy projects. The Hawaii State Energy Office highly recommends retaining advisors familiar with Hawaii’s regulations, processes, and customs. This list includes some of these consultants. These resources are advisory and for informational purposes only and may not be relied upon to determine regulatory or interconnection requirements for any project. Contact the appropriate permitting agencies directly for permit information. The listings, associations, and contacts herein are provided for informational purposes only and are not meant to be all inclusive. The Hawaii State Energy Office does not endorse or certify the individuals, firms ,or businesses on these lists. If you are a firm that engages in the specialization of commercial scale renewable energy project development, finance, consulting or investment services and wish be to added to the content found in these following summary pages, we welcome you to contact us and provide your information for listing.